The Roman Road that runs from Worts Causeway to Horseheath has been called many names over the years but the most common one is that of Worsted Street. This and Wool Street, (or Wolves Street), another name given to it, might both refer to mediaeval times and an association with a landowner, and trade in cloth. It runs in a very straight line between Worts Causeway and the A 11 (which follows approximately the same line as that taken by the Icknield Way from Worsted Lodge to Newmarket); but southeast of Worsted Lodge, the road has some shifts in alignment and odd kinks. Along parts of the northeastern end, a pronounced bank with ditches on either side shows how well the road has survived. Roman roads were built by quarrying along either side and compacting the upcast into a bank, or agger, in the centre to form the foundation of the road, the surface of which was then often metalled in some form or other. The cambered agger then allowed rain to run off into the roadside ditches. Roads came in three general categories: main routes surfaced with stone so that they could be used in all weather; secondary roads that were surfaced with gravel; and others that were local tracks, probably impassable in wet weather. The straight lines we associate with Roman roads come from Roman methods of surveying, but are in fact made up of a series of long straight sections with short changes of course to bring the road back in to line. In the nineteenth century, Worsted Street was variously described as Iron Age in date and one of the Cambridgeshire Dykes, or as part of a Roman road that ran from Colchester to Chester, and so was given the misnomer of Via Devana. Serious archaeological excavation of Worsted Street has occurred three times: once in the 1920s when Cyril Fox from the Cambridge Antiquarian Society cut two sections across the road, near its northeastern end; once during 1959 when a gas pipeline was inserted along the length of much of the road; and in 1991 at Worsted Lodge prior to widening and dualling of the A 11. All this work confirmed the Roman nature of its construction along the stretch north of the A 11, with a rammed chalk foundation topped by gravel metalling. Its construction further south, however, was less impressive and distinctly different from that to the north. Excavations north of the A 11 have shown that the ditches are 14m apart and between them lies an agger 3 – 5m wide and up to 2m high. Evidence for the date of construction of the road has been largely absent, apart from coal found beneath the agger by Dewhurst in 1959 who concluded that it must, therefore, be later than the 1st century AD. The foundations of the road had been laid directly onto a de-turfed land surface, and so a buried soil survived, from which it was possible to find molluscan evidence for the kind of local environment into which the road was built. This showed an open treeless landscape, possibly heavily grazed or recently cultivated, but also a woodland phase at a period not too long before construction. 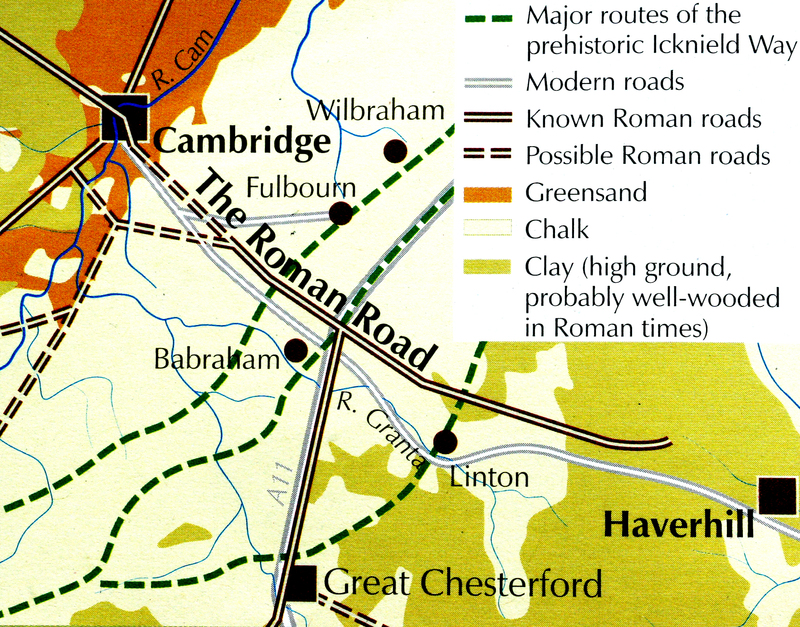 The interpretation would suggest that Worsted Street was a Roman road of local importance along the northeastern end, connecting Cambridge to the Icknield Way and the road to Great Chesterford. The continuation to the southeast would seem to be of lesser importance but allowed access in good weather to the Stour valley and beyond. This arrangement seems strange as a more direct route from Great Chesterford to Cambridge must have existed following the river valley of the Cam. Such an apparently illogical road system can be explained, however, if Worsted Street actually followed the route of a pre-existing road, a prehistoric ridgeway with its northern end running from the twin forts of War Ditches and Wandlebury, and thereby joined the important routeway (Worts Causeway), which crossed the Cam at Trumpington, with the Icknield Way zone and beyond. It is, therefore, the Iron Age and earlier landscape which determined the line of the Roman road, but it is Roman engineering and mediaeval repairs that have left us the legacy which we know today.